China’s high-speed rail system has offered affordable, sustainable alternatives to travel for China’s residents, while strengthening the linkages between China’s emerging cities. Photo by Michael Vito/Flickr. In the past few years, China has made eye-catching achievements in building the world’s largest high-speed rail system, with a total length of over 9000 km (5,600 miles) in operation in 2012. In China, trains travelling at design speeds above 200 km/hour (124 miles/hour) are considered high speed, including bullet trains running on upgraded mixed-used rails, which have been in place since 2007, and those running on passenger-dedicated lines excluding freight transport, which have been in operation since 2008. This article analyzes high-speed rail’s impacts on the economic landscape of China’s regional transport sector during the first five years of full operation. It illustrates that: (1) High speed-rail did not put airlines and highway transport out of business as many were concerned it would; (2) The significant economic benefits of travel time savings for rail travelers; (3) The potential benefits of shifting capacity to freight transport on conventional rails have been less than expected. The opening of the major high-speed rails led to an immediate sharp drop in the occupancy rates of airplanes and even cancellation of some short-distance flights (e.g., Beijing-Taiyuan, Nanchang-Hangzhou). However, the ridership picked up later after airline companies adapted pricing schemes and improved punctuality. 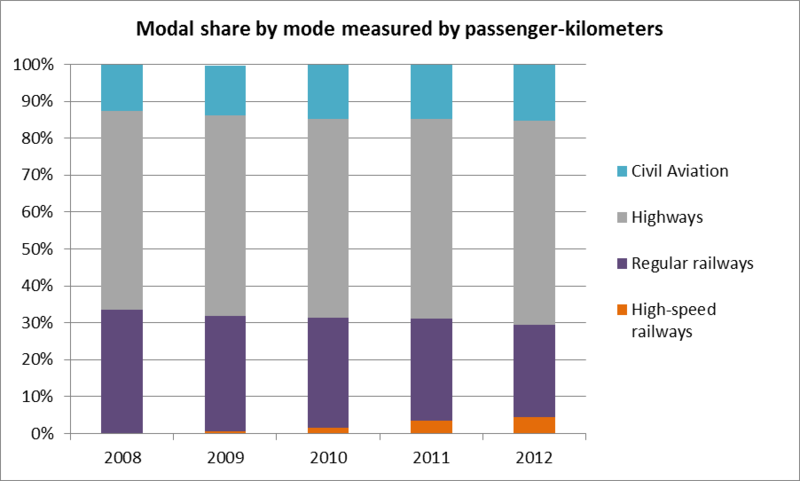 The overall modal share – which measures the portion of the passengers using a given transport option – of railway transport remained stable even after the introduction of high-speed rail in 2007. Railway transport accounted for 5% of travel measured by number of passengers and 30% measured by passenger-kilometers. High-speed rails did not attract many passengers from airplanes or buses to rails at a national scale, but instead shifted those who were already using conventional trains to high-speed trains, as shown in the graphs below. 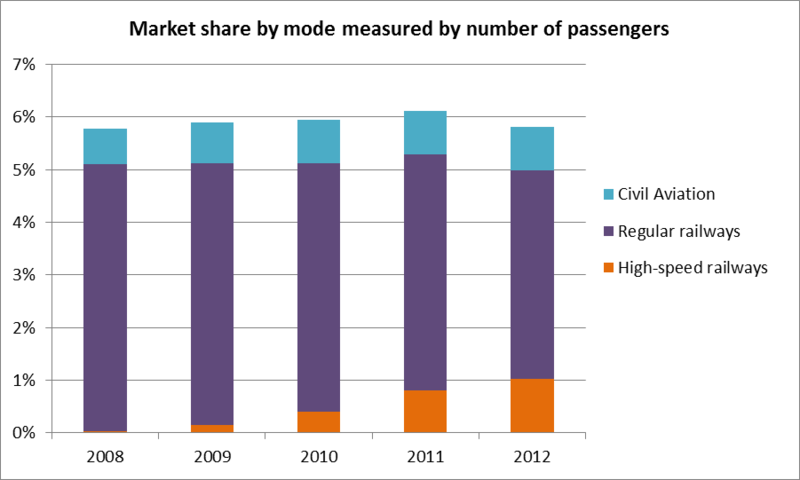 Market share by mode measured by number of passengers. Data via China Statistic Yearbook, 2013. Market share by mode, measured by passenger-kilometers. Data via China Statistics Yearbook, 2013. Note: Percentage of passengers travelling by highways is not included in the first graph because it is too large and makes other modes invisible. Inland waterways are not included as the mode share is less than 0.1%. In China, the average travel distance by mode is around 50 km for highways, 500 km for railways and 1500 km for airlines, and the pattern remains almost unchanged over the past decade. Each mode has its unique niche in the national transport system with respect to distance traveled. Given its competitive advantage, high-speed rail has an important role to play in strengthening the linkages within existing and emerging megalopolises (groups of spatially proximate and economically integrated cities) in China. This is in line with China’s recently released National Plan on New Urbanization (2014-2020), which aims to optimize regional spatial structure and foster collective economic growth in the form of urban clusters. As shown in the graphs above, the real change in modal share occurred within the railway sector. In 2012, one out of five people traveling by rail was taking high-speed rail. 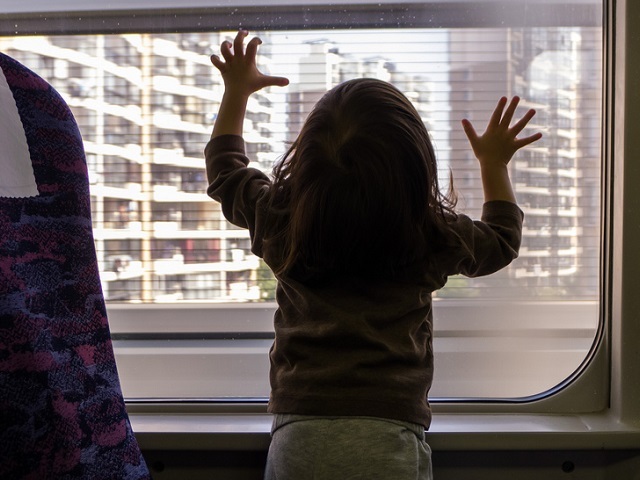 High-speed rail has remarkably improved the service quality and efficiency of railway transport, leading to enormous time savings for travelers. The average traveling speed of conventional rail is about 65 km/hour (40 miles/hour), while high-speed rails traveled at an average speed between 140 – 160 km/hour (86 – 99 miles/hour) from 2008 to 2012. The time savings for the five-year period is estimated to be around 2.4 billion hours in total, or 2.8 hours per passenger trip. Assuming that the time saved would be spent on productive activities, the monetary value of the time saved could reach US$ 7.25 billion (45 billion RMB). This is a conservative estimation considering that people who travel by high-speed rail may have higher-than-average value of time. It has been argued that by moving passengers to high-speed rail lines, it is possible to release more capacity on conventional rails for freight transport. However, this argument is not confirmed by empirical evidence. Even though the absolute amount of freight by all modes grew between 2008 and 2012 due to a booming economy in China, the percentage of freight shipped by railways kept declining in terms of weights and volumes despite the introduction of high-speed rail. This trend is explored in the graphs below. 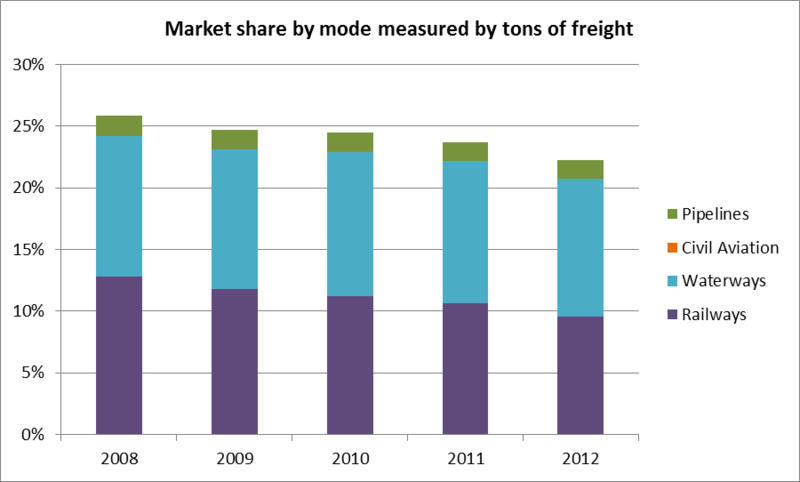 Modal share by mode, measured by tons of freight. Data by China Statistics Yearbook, 2013. Note: Percentage of freight by highways not included in the first graph. While it may still be too early to draw concrete conclusions regarding high-speed rail’s long-term impacts on the economic landscape of China’s regional transport sector, available evidence indicates that during the first five years of full operation, the impacts of high-speed rail have been dominated by qualitative improvement instead of quantitative expansion of the railway sector. High-speed rail enhanced the competitiveness of the railway sector and created incentives for alternative transport modes to improve service quality as well, which eventually led to efficiency gains for the whole society. Understanding the nature of such impact is important, as the high-speed rails currently in operation are in the busiest transport corridors connecting affluent regions of China, and the uncertainty in obtaining market share will increase as the high-speed rail system expands to less developed regions with lower willingness or ability to pay. Further improvement in railway sector’s competitiveness should combine better service quality with more flexible pricing schemes.